← Flu Season! Time for a shot or not? Anyone who lives on a ranch knows about manure and most of us have been up-close and personal with the stuff more than once. Liquid gold, as far as I’m concerned, but if you’re the one on the receiving end of the poop it’s not always quite as amusing. My daughter had a narrow escape a while back. We were milking and Maybelle the cow cocked her tail. Since my daughter was standing behind the cow at the moment, I suggested she might want to step sideways. And a good thing she did, too, as right in the middle of evacuating her bowels, Maybelle coughed. 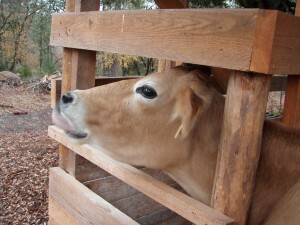 A jet-propelled stream of manure shot out the rear end of the cow and landed about six feet behind her. Naturally, I was rolling on the floor with laughter, while my wide-eyed child cursed. I pointed out to her how lucky she was to have moved when I suggested it and we speculated on the reaction had it been the oldest granddaughter standing there. S–t happens. It happens on your boots and your pants and your hands, and sometimes, if you’re really unlucky, on your face and in your mouth. I’ve always operated on the principle that you just clean off what you can and go on with the day. I figure if I support my immune system, a little manure is not going to be the end of me. I tell this story to make the point that we are much too paranoid these days about germs and the substances bearing germs we may encounter. Basic cleanliness will keep almost everything at bay in the home and ranch environment. Sterility is necessary in operating rooms or for patients who have just had a bone marrow transplant and have literally no immunity. In real life, we need to accept that the kids will get filthy. They will be licked on the face by dogs, they will come to the table with hands that look as if they’ve been digging in the mud – because they have – they will pick things up off the floor and put them in their mouths. Boots will come into the house with manure on them. Dogs will bring home a moldy bone that they buried a few months ago and have just dug up. Cats will bring home all manner of freshly killed rodents and want to drop them on the carpet. 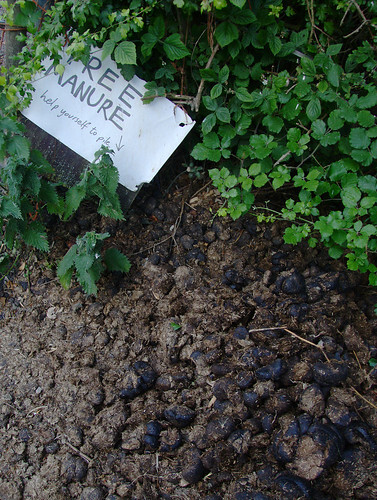 When you look at it from that perspective, what’s a little manure? This entry was posted in Farms, Health. Bookmark the permalink. Do you read ”Liquid Gold – The Lore and Logic of Using Urine to Grow Plants” By Carol Steinfeld? Its a great green books . Liquid Gold shows how urine is used worldwide to grow food and landscapes, while protecting the environment, saving its users the cost of fertilizer, and reconnecting people to the land and the nutrient cycles that sustain them. Yes, goats do have an advantage in that respect. I have no experience with them because my dearly beloved spouse HATES goats. Maybelle usually does her business as soon as she sees us coming and before she comes in the milking shed, so I can’t really complain. One of the reasons I prefer goats to cows for small homestead dairy — their manure is, shall we say, more easily managed. I’ve NEVER seen goat berries propelled more than a few inches, and they nicely roll out of the way when you give them a gentle kick. Also, I’ve NEVER had a goat have an “accident” on the milking stand, whereas I’ve seen cows splash all over the place in the middle of a milking.